The work on the world-class Convention Centre at Aakulam will be inaugurated on June 4. Here is the impressive looking perspective of the signature project, which will change the face of Kerala. The question of how the growth of Kerala's cities is to be planned was part of the discussions at the National Seminar on Spatial Technologies for Land Use Planning in Trivandrum the other day. The Governor of Kerala called for vertical growth to make the best use of scarce urban land. His view was one side of a major discussion - the debate over vertical versus horizontal growth in urban planning - which has been raging in cities across the world for a very long time now. Various theories and models have been developed to explained the various growth mechanisms of urban areas. In many cases, the pattern of growth is often a product of geography or of the socio-economic evolution of the particular urban area, as is the case with many natural systems. The jury is still out on as to which model is the best for the citizens or even as to whether the different models can be or need to be compared. 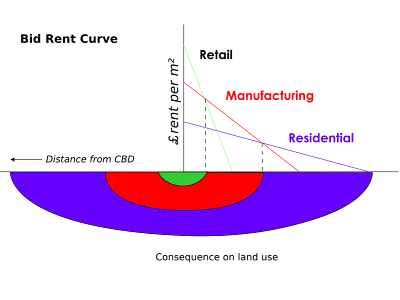 When a city has a high-density Central Business District surrounded by decreasing zones of development density, the urban agglomeration is said to be distributed as concentric rings. This form of urban development is seen in cities like New York or Chicago or Mumbai, to a lesser extent. The CBD usually has, as it name implies, most of the business space in the urban area along with some residential areas. The cost of space is usually very high due to the limited space and the high demand. However, while up-market residential and business space is very expensive, many inner cities of this type also have run-down areas inhabited by the less well-off among its citizens. These could be the older parts of the city centre where the dilapidated buildings find few high-income takers or where the transportation network is poorly developed. These areas usually spiral downwards unless revived with comprehensive redevelopment schemes. Immediately outside the CBD lie mid-rise districts with a predominantly residential nature. The residents are mostly middle-class and this middle ring is usually well linked to the city centre through public transport. Finally, there are the suburbs which lie farthest for the centre of the ring city. These are almost exclusively low-rise, usually detached houses which are inhabited by the upper and middle classes. The suburbia, familiar to us in innumerable movies, is far removed from the hustle and bustle of the city centre but necessitates a long in-and-out trip everyday, the famous “commute”. The concentric ring model may sound very convenient, and indeed, anyone not too kindly disposed towards social equality may see it as a great way to keep the masses down. Other than the fact that it creates and encourages social inequity, the concentric ring structure also imposes other difficulties like inefficiencies in transport. That may sound counter-intuitive, after all isn’t simple for everyone to travel in and out of a single focal point? But, what if the Airport is on the other side of the CBD? It means either a long, frustrating trip through the chaos of the inner city or a even longer detour along a ring road, if one fortunately exists. The congestion at the city centre usually means very tall buildings and expensive real estate. Even if an alternate or parallel CBD was proposed, organisations may be reluctant to leave the existing centre of activity and such a shift would also require a massive change in the supporting infrastructure which would be focused on the existing CBD. This structure looks very much like the typical pie diagram that one sees a lot in presentations and textbooks. The urban area is divided into often well demarcated areas arranged around a common centre, where the land uses varies from sector to sector. So, one sector may be dedicated to industrial manufacture, another to high-rise residential and a third to mid-rises. Such structure can be seen in cities like Calgary, Canada. The Sectoral model enables easy expansion of the city outwards as long as radial space is available and is not constrained by some natural barrier like a water-body. However, conflicts of interest between adjacent zones of different types – say heavy industry and residential – is not uncommon. Sectors may not be planned as such, and may develop over time due to a variety of factors. A natural harbour could develop into a commercial and entertainment zone (around a marina, perhaps) or into a industrial zone. The repercussions on a neighbouring residential zone are obviously radically different. Having different sectors scattered all over the place also makes the transportation solution a very complex one. Different routes may need to be developed for routing people and cargo, for example. No, I have not deviated into zoology. Rest assured, the multiple nuclei model is yet another form that a city can take, even if it sounds like something that got left behind when the little green men left after their picnic. As its name implies, this model describes urban areas which have more than one centre. There are two or more centres of activity surround by areas of residential or mixed use. Multiple nuclei can evolve over time from the concentric ring structure, for example. You must think I am off my rocker, when I say cities evolve. Surely, evolution is the property of living things, as Mr. Darwin said. Well, cities are living too, aren’t they? In a way, urban environments are complex ecosystems populated by millions of intelligent constituents, including you and me. Like any dynamic system, cities too can evolve. In fact, far from being a property only of living things, elements of evolution can be seen in any system in which there is change and competition. Multiple nuclei can evolve when a city develops new centres as its original one gets too congested. Look at Mumbai, for example. Once, South Mumbai with Nariman Point and its skyscrapers as its focus, was the island city’s only CBD. Over time, as this centre became impossibly congested, new business districts have evolved, most notable in Bandra-Kurla and in Navi Mumbai. The same is the case with Gurgaon and Noida in the case of New Delhi. These nuclei may each have residential districts develop around them as people try to minimise the commute to their respective work places. While the new nuclei may give the city more scope to expand, it is not without its own ails. Each nucleus and its surrounding areas may not be totally self-contained. In Bangalore, for instance, there are multiple business hubs – Electronics City, Whitefield, Airport Road, Outer Ring Road etc – but most of the social infrastructure lies in a few areas mostly in South Bangalore, which leads to very heavy commuting and its associated chaos. Multiple nuclei almost invariably require high-volume transportation systems like Mass Rapid Transit Systems (MRTS) which are very expensive but are indispensable to move hundreds of thousands of people quickly, safely and comfortably. High speed linkages also need to be put in place to allow access to common infrastructure points like the city’s airport(s) or railway station(s) from all the nuclei. Strong urban planning is also called for to ensure that mixed-use development surrounds each nucleus, reducing the need for long commutes. Signalling the start of Kerala's largest IT project, the Kerala Govt. has released the Request for Qualification (RFQ) for the massive Technocity project in Thiruvananthapuram. The RFQ has been floated by the KSITIL, the Special Purpose Vehicle floated by the Government. With this, the stage is set for the four month long bidding process for the Rs 8,000 Crore ($ 2 billion) mega-project, sprawled over 500 acres on the outskirts of Trivandrum city. Meanwhile, the need for Technocity was again made clear when Kerala's IT export figures for 2007-08 were released about a week ago. As per STPI's count, which tends to be quite conservative, the State's IT revenue zoomed by almost 60% to Rs 1200 Crores. Of this Rs 225 Crores was from Infopark and the rest - almost Rs 1000 Crores - from Technopark. Impressive as this growth sounds, the sum total is woefully small when compared to the likes of Bangalore, Chennai or Hyderabad. What we need is a mega-project to give us a quantum boost, rather than incremental growth. Technocity, located in the IT hub of Kerala, will fit the bill just fine!!! The Govt. of Kerala has officially announced the commencement of development of Kerala's largest IT project - Technocity, Trivandrum - with an advertisement appearing the regional and national editions of the Economic Times, Business Standard and the Business Line. Click on the image for a bigger version. Today that coveted title is hotly contested by two Asian ports - Singapore and Yanshan. While the former is familiar to us, the latter is a relative newcomer - it's been in existence for all of three years now! National Geographic Channel carried a one hour program on Yanshan yesterday, it made for interesting viewing. The facts were incredible. - Yanshan is the new port being developed near Shanghai to cater to the container traffic of the commercial capital of China. - Yanshan port is an artificially created island, located 32 Kms offshore. - The cost of the port when it is completed in 2020 will be nearly $ 20 Billion (Rs 80,000 Crores)!!! - The port necessitated the construction of the world's second longest sea crossing bridge, a whopping 32 Km long. - Yanshan will have nearly 30 Km of quay and can handle 50 of the world's largest container ships. - At full development, Yanshan will handle over 25 million TEUs a year and be the world's busiest container port. One would be forced to wonder why the Chinese built a port 32 Kms out to sea, the distance from Trivandrum to Varkala? The answer is simple, the one parameter which determines whether a port can become be classified minor, major or truely world-class - draught! The congested Shanghai port, an estuarine port like Kolkata or Cochin, could not attain a draught beyond 12-14 m, despite dredging millions of cubic meters of silt a year. Yanshan, built 32 m out to sea, still manages a draft of only about 16 m or so, which is barely enough to accomodate ships of 10-12,000 TEU - the largest sailing today. However, ships of upto 18,000 TEU are under design today and it is estimated that ships of over 10,000 TEUs will account for a major share of container traffic by 2015. Even Yanshan will find it tough to accommodate these behemoths. Billions of cubic meters of silt will have to be dredged if it is to even make a try. Today, long before any dredger arrives, there is 16 m of water depth available just 500 m from shore at Vizhinjam. With the minimum of development, Vizhinjam will have upto 18 - 24 m of draught available in its basin, enough to accommodate ships bigger than the biggest giants on the drawing board as of now. Yet I wonder if there is anyone listening. Finally, at long last, the news that the whole of Kerala and India, and Ananthapuri in particular, was waiting for. The tender to Build, Operate and Transfer India's deepest port at Vizhinjam has been awarded to a consortium led by the Lanco Group. 3. Pembinaan Redzai Sdn Bdh(Malaysia) - Pembinaan Redzai owns some 40% of Westports Holdings Sdn Bhd which runs one of two container terminals at Malaysia's Port Klang, one of the busiest container ports in Asia. Pembinaan is also affliated to IJM Corporation Bhd, the largest construction and engineering group in Malaysia and a specialist in global BOT operations. Work on the Rs 8,000 Crore project, by far the largest infrastructural development in Kerala, will begin in 8 - 10 months time. Great news indeed for Kerala and one that is sure to send a shiver down the spines of the competition, lol! More soon, stay tuned. But you will read precious little at Kerala's "most popular daily", which chose to almost completely ignore the largest development in the State's history even when devoting columns and headlines for even trivial happenings in places other than Trivandrum. QED. 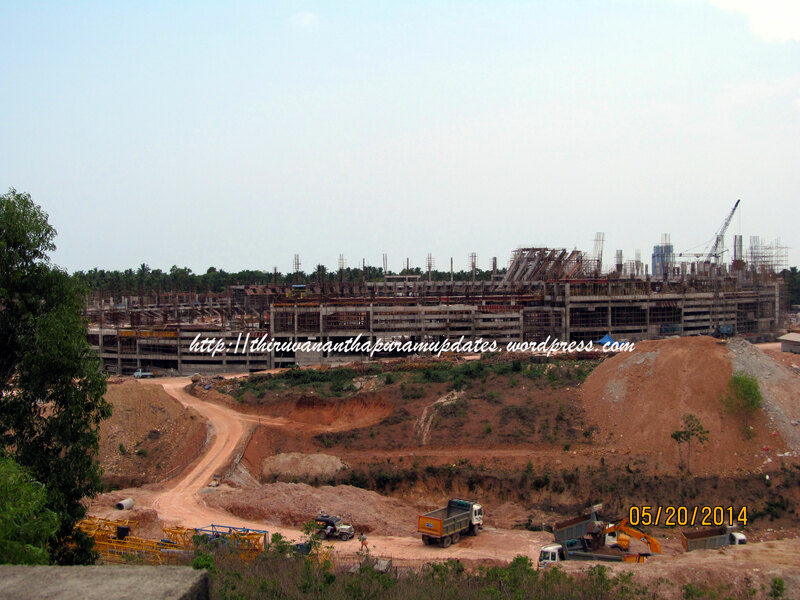 After nearly two years of waiting, things are beginning to really move on Kerala's biggest IT project - Technocity. This integrated development, in the Northern suburbs of Trivandrum is probably Kerala's only chance of breaking into the IT Major League in the foreseeable future. The SPV set up by the Government of Kerala for developing the mammoth Technocity project - Kerala State Information Technology Infrastructure Ltd (KSITIL) - has come into existance. Its website is here. Technocity has been given pride of place on the KSITIL's project map and if you scroll down diligently on this page, you will find details of the project. The Government seems to have learned its lesson on plunging head-first into uncertain projects. After having burned its fingers on "Smart" City - where the developers are still busy short-listing masterplanners a year after the project was supposed to take off - the Government is going through the Global Bid route to select capable developers who will really create a world-class technopolis rather than just wax eloquent over it for ages and ages. Good choice! Let's keep our fingers crossed till the bid process - due to start this month - is completed. Stay tuned!